← The font in St. Mary’s parish church, Bideford. In 2009 I had the great honour of becoming Bideford’s first lady Beadle, and later in 2010 of being appointed as the first lady Macebearer. Ever since I was a child I have been interested in the ceremonial and regalia of the town, having been taken to Remembrance Day services and Mayoral Parades by my grandmother. My duties as a Beadle include accompanying the Mayor and Mayoress on civic and social occasions and being responsible for their full chains of office. As the Macebearer, which was formerly known as ‘Sergeant at Mace’, I summon jurors from all four wards of the town for our ancient Manor Court, which dates back to Saxon times and for which I am sworn in as the Tithingman, an early officer of the court responsible for bringing miscreants before the Lord of the Manor or his Steward. This court is now an opportunity for townsfolk to put forward presentments to be considered for the betterment of the town. I particularly enjoy giving talks on, and tours of the Town Hall, Council Chamber and Mayor’s Parlour, showing the town’s artefacts and treasures to interested groups and organisations. We have three Royal Charters, wonderful portraits and pictures, silverware, rolls of honour, twinning documents and gifts etc. For civic occasions I have the privilege of wearing the traditional robe and tricorn hat and carrying two of the four historic silver maces, the lesser ones dating back to Elizabeth I and the greater ones to Charles I. These are a symbol of the authority and dignity of the Mayor and are carried in front of him or her. I belong to the Guild of Macebearers, an organisation which gives advice to its members as to civic protocol and whose patrons include The Lord Mayor of London and Speaker of the House of Commons. 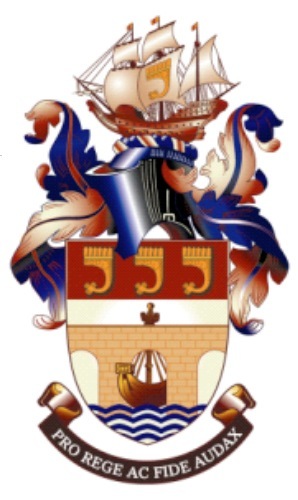 Being a native of Bideford, I am delighted to be one of its civic officers as I am familiar with its history and have known many past mayors and dignitaries so it is my great pleasure to pass on my knowledge and to continue the traditions of the town I love. This entry was posted in History, Local People and tagged Beadle, bideford, Bideford Town Council, macebearer. Bookmark the permalink.